UPDATE 6/26: Yesterday I received a very cordial and apologetic email from McMaster-Carr, explaining that they have had problems with “piracy” on their web site and that my experience was an error of mistaken identity. They sounded genuine and assured me that it would not happen again. Good thing, too, because I don’t know how I would have never shopped there again. I love you too, McMaster-Carr. We’re cool. 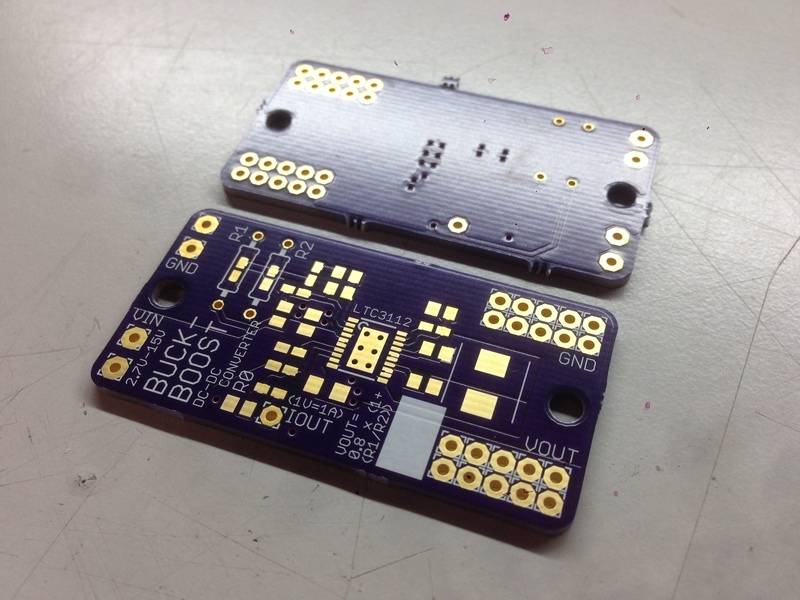 With Adafruit’s lithium ion battery pack and USB/DC/Solar charger our power strategy is off to a good start. 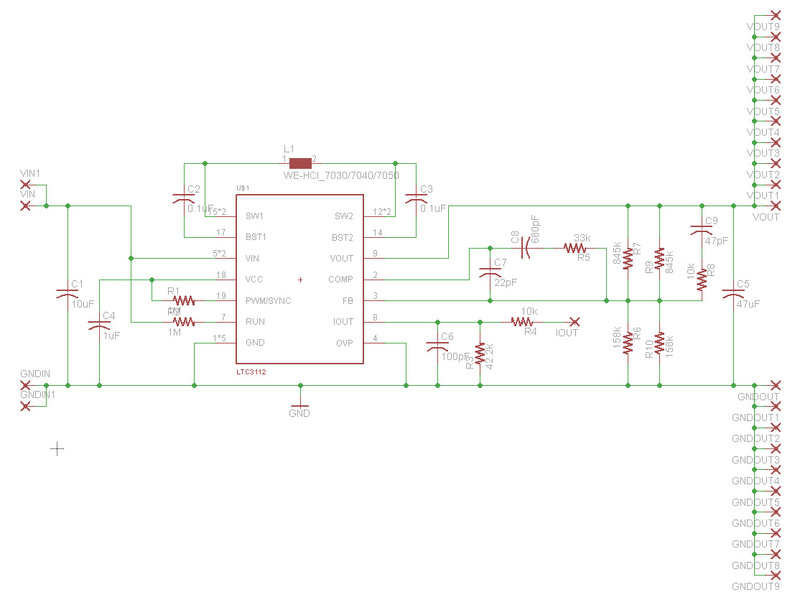 I chose those in part because I could easily add a solar panel later, but assuming the robot is running continuously, that would result in a possible output voltage range from 2.5V (the shutdown voltage of the LiIon battery pack) to 6V (the full-sun output of the solar panel). 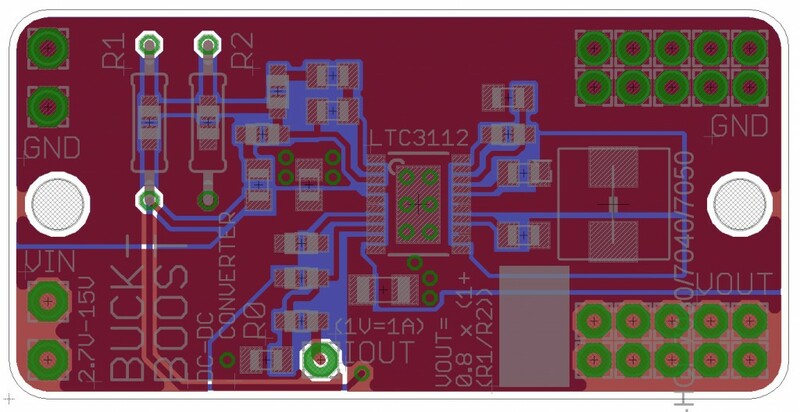 The Raspberry Pi (and ATMEGAs, which I’ll probably use as ‘standalone’ Arduinos) want a 5V supply, requiring either a buck or boost depending on the output voltage from the charger. I couldn’t find any turnkey solutions, but I did find this buck-boost DC-DC converter IC. The LTC3112 from Linear takes 2.7 – 15V in and provides 2.5 – 14V out, configurable with two resistors. Maximum current depends on Vout, at 3V in and 5V out I should get at least 1A. The documentation included some pretty thorough design guidelines, including a complete demo board schematic and layout, so I set about designing one of my own. 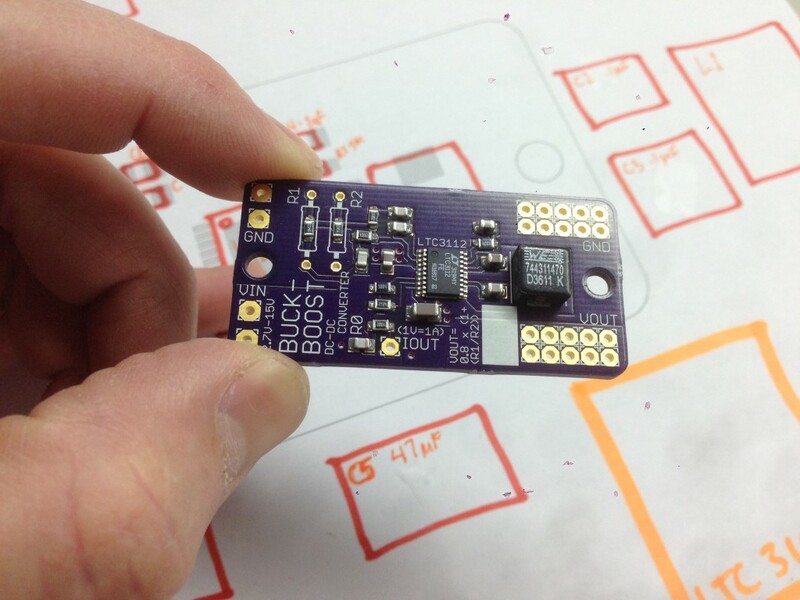 The design is pretty similar to the demo board. I removed a few things I didn’t need and added a bunch of output pads, and a second set of inputs so additional boards can be daisy chained. 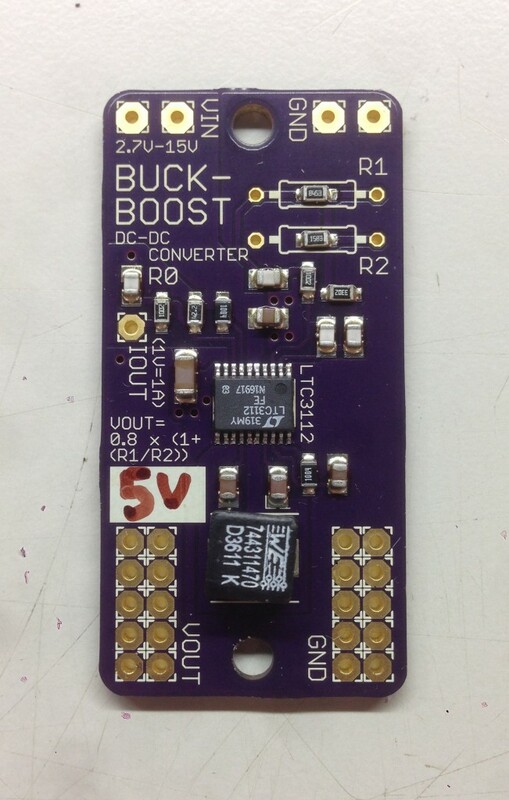 I’m told the component layout of boards like these is extremely sensitive, so I stayed as true to the demo board’s layout as possible. 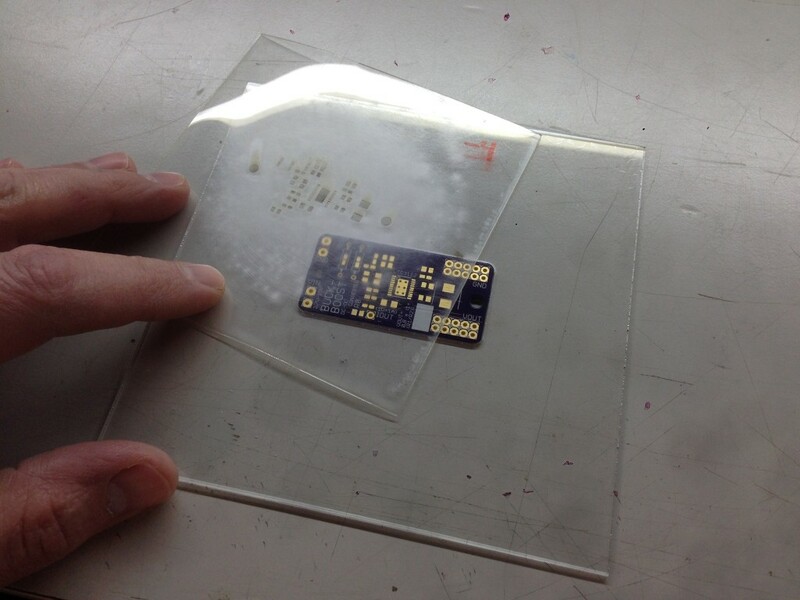 I’ve been wanting to try outsourcing my PCB fabrication, and I think this finicky design was a good one to start with. The best value for this one seemed to be OSH-Park, and the process was really easy and smooth. They even take native Eagle files, so there was no messing with Gerbers, etc., and the instant preview made it easy to catch errors. Two weeks later I got three of these beauties in the mail. Ten bucks, delivered. Typically the next step for me would be dabbing tiny dots of solder paste onto the pads and mashing the components into them, but these boards look so nice and professional that I knew it was time to try a solder stencil. I recently gained access to a laser cutter, so I ordered some .004″ thick Mylar from McMaster and conducted a quick test. I first exported the “Cream” and “Dimension” layers from Eagle as a 1200 dpi .png image, then brought that into Photoshop. I then selected all the pads (Select -> Color Range on black) and shrunk them down one pixel layer at a time using Select -> Modify -> Contract, Saving As every time until I had seven different versions, each one eroding the pads by about .0008″ all around. I cut these on the laser, using Raster settings of 30% power and 40% speed. 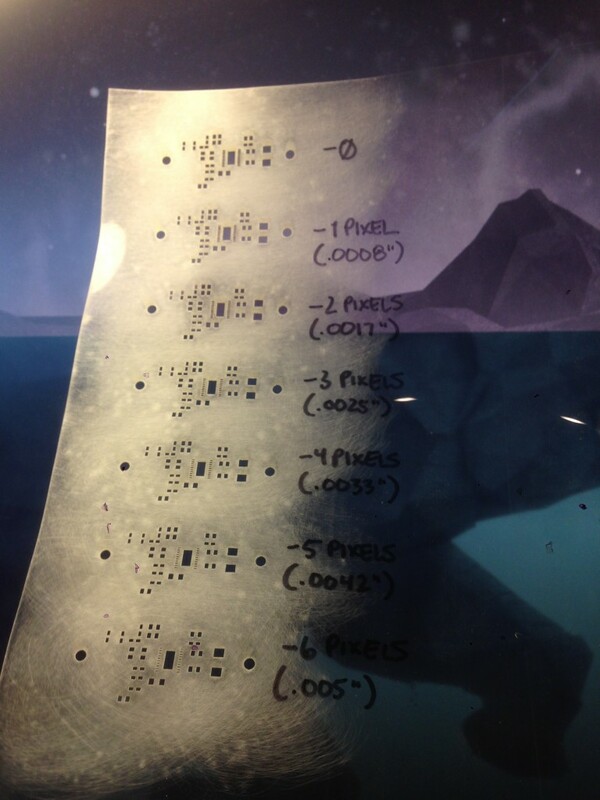 Turns out the best one for this layout (with the fine pitch of that IC) was the “minus 4 pixels” version. By the way the fogginess of the Mylar there is the result of sanding off some very small ridges that had formed around all of the openings. Next I made a couple of fresh ones and cut a piece of 1/16″ acrylic to serve as a fixture to hold the board in alignment with the stencil. Here we go. First try, not bad! 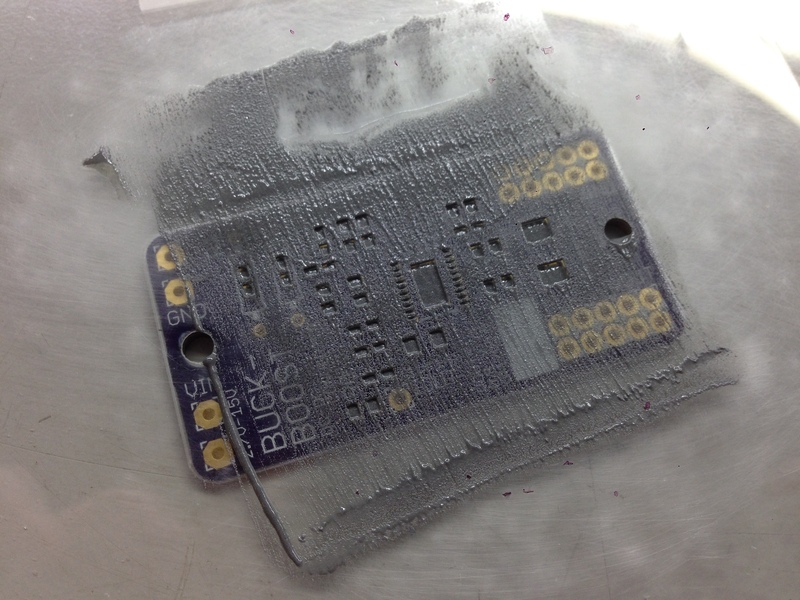 I made a little mess in the mounting holes, but generally the transfer was nice and clean. I tweezered the components onto the board (my cheat sheet can be seen in the background) and fired up the reflow toaster oven. The inductor slid around a bit as the solder melted, but it’s still on its pads and not touching anything else. The IC looks perfect. 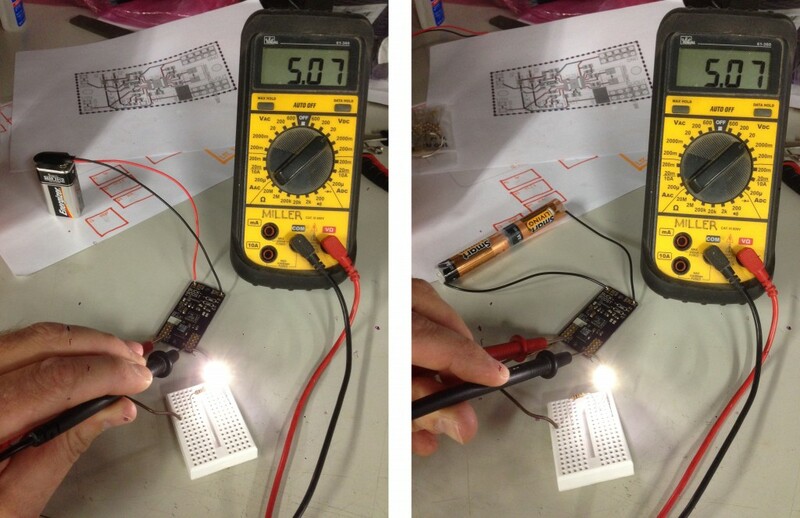 You can see where R1 and R2 can be changed with thru-hole resistors to provide any output between 2.5 and 14V. The IOUT pad provides an analog voltage proportional to the current draw of the load, which I may end up using to monitor which systems are consuming the most power. I works! 9V on the left, 3V on the right, identical output (and pretty darn close to 5V, too). I realized I had to hook up an LED to get a good output, probably because the multimeter was not drawing enough current and the IC went into a shutdown mode. Robot is ready to go wireless! © 2019 design & make. All rights reserved. Apricot theme designed by Ardamis.com. XHTML, CSS.